Hestla is a Nord vampire living in Volkihar Keep. She was once a member of the Companions but left because she didn't like their attitude. She claims that while the others were stronger than her, she could now defeat any of them easily. What strength she lacks with her claws she makes up for with her hammer. She looks up to Lord Harkon, and mentions his strength in conversation. Hestla wears a set of red colored vampire armor with a matching pair of boots. 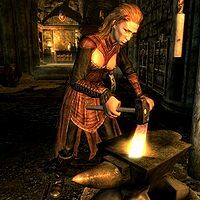 She is equipped with a leveled one-handed weapon which can be up to elven quality. She carries random leveled bandit loot, as well as a 25% chance of carrying 1-9 gold.